The reaction to the crisis has inadvertently granted the European Commission with increasing competences for the control of the provision of (non-economic) public services by the Member States. Το ελληνικό πολιτικό σύστημα βρίσκεται σε αναβρασμό, οι πολίτες είναι δυσαρεστημένοι και ο καθένας αναλύει τη δική του θεωρία: Για μερικούς φταίει το μνημόνιο, για άλλους τα δυο άκρα, για κάποιους η έλλειψη κεντροαριστεράς –υπάρχουν ακόμα και κάποιοι που πιστεύουν στις διεθνείς συνωμοσίες. For two decades and more, the European Union has been trying to get ‘ownership’ for structural reform in Greece. Spending has been savagely throttled back. But there is no click, no reset, no moment on the road to Damascus, where the Greek government and Greek society ‘gets’ the need to change. Despite a somewhat promising start, the outgoing coalition government of New Democracy (ND), PASOK, and the Democratic Left proved to be short-lived, giving way to a more compact bipartisan cabinet consisting of only ND and PASOK ministers (at an agreed ratio of two-to-one). Toiling under the shackles of a sclerotic austerity program, the first few true attempts at structural reform and downsizing of the wider public sector met with mixed reactions and caused the three-party coalition government to implode. This is only the first episode in a new political era of short-lived coalition governments with shifting partisan compositions. 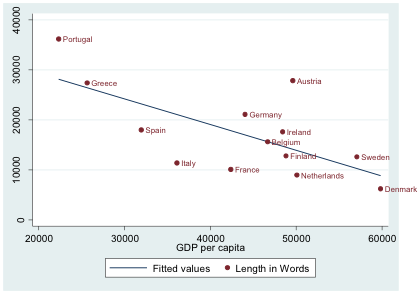 Becoming True European Citizens: The Only Way out of the Crisis (and beyond)? Citizens of the European Member States seem to be resorting back to Euroscepticism and show clear signs of cold feet regarding the single market / single currency project (reality?). 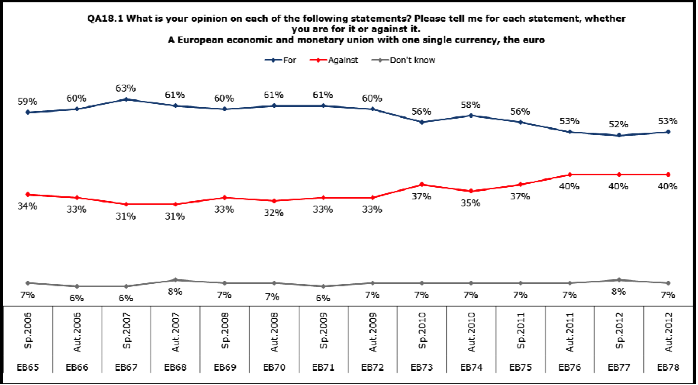 According to the December 2012 Eurobarometer, 40% of the population of the EU Member States is against the European economic and monetary union with a single currency (with an additional 7% showing scepticism or, simply, lack of knowledge about the project).